"Kitsuki Shomon was a good and honorable soul; she did not belong in the City of Lies, with its opium trade and its fireman gangs and its courtiers who knew there were ways and ways of manipulating someone, not all of them obvious." 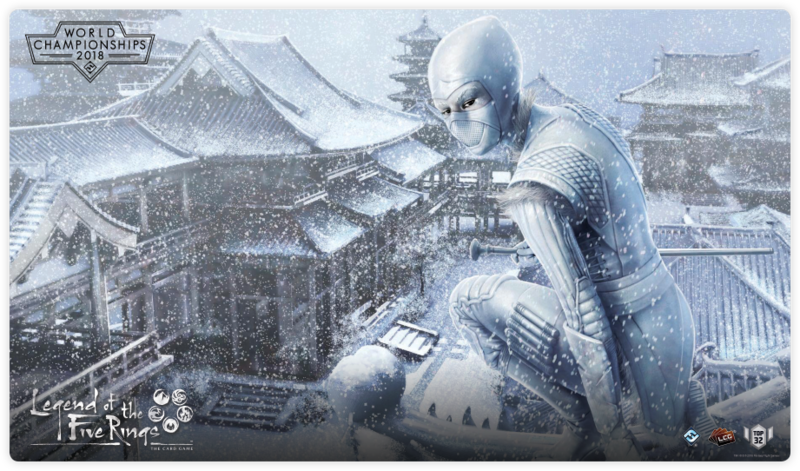 The greatest samurai from the seven Great Clans will soon make their way into Scorpion territory to attend the Emperor's Winter Court. 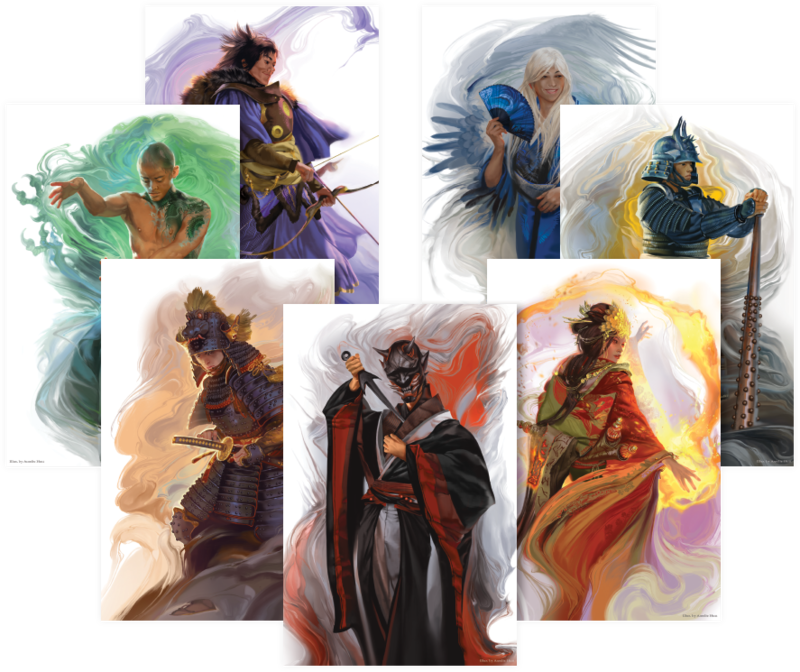 Taking place November 1 – 4 at the Fantasy Flight Games Center in Roseville, MN, the 2018 Winter Court World Championships are the pinnacle of Legend of the Five Rings: The Card Game Organized Play. Hatamotos and other notable samurai will come to be honored, and then they will honor their Emperor in a tournament of noble duels. At the end of the Winter Court, one samurai will have risen above the others, and this samurai will be given the title of Shogun—and presented with a decision that will help shape the future of Rokugan. As for the others? They, too, will find glory and riches befitting their skills. And what will these prizes be? Well, the Scorpions may be famous for their many spies, but they aren't the only ones capable of acquiring sensitive information. Today, we are happy to reveal the secrets we've uncovered from deep inside the City of the Open Hand! 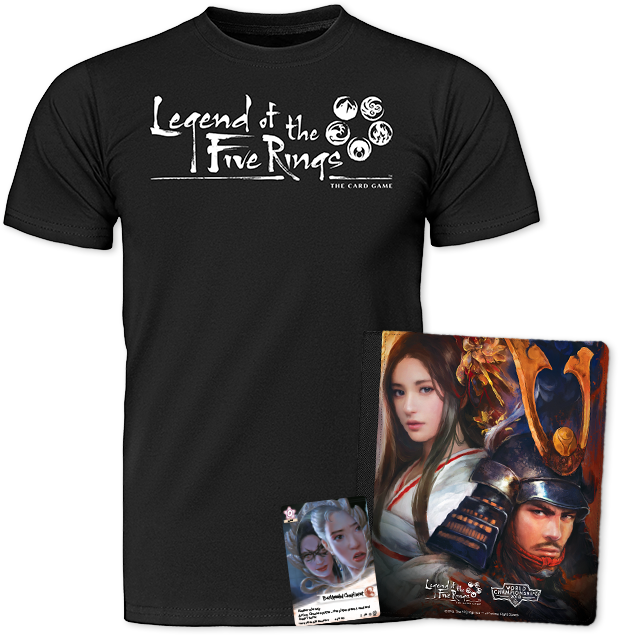 Each samurai who travels to the Winter Court will claim a participation prize package that consists of a commemorative T-shirt, an extended art copy of Backhanded Compliment, and a four-pocket card binder. 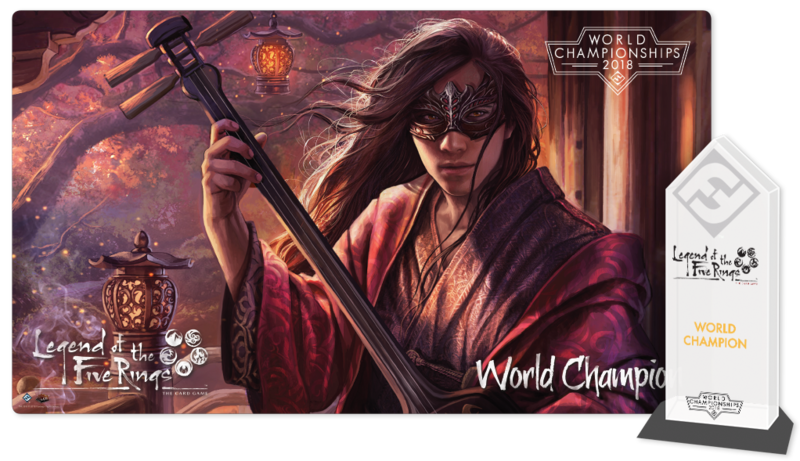 After each of the Winter Court's first two days (Day 1A and Day 1B) the Top 8 representatives of each Great Clan will gain their Clan Champion's favor in the form of an exclusive, World Championship variant of the Champion's card. This card will feature golden, metallic ink, a striking black background, and an intricate new Winter Court frame. 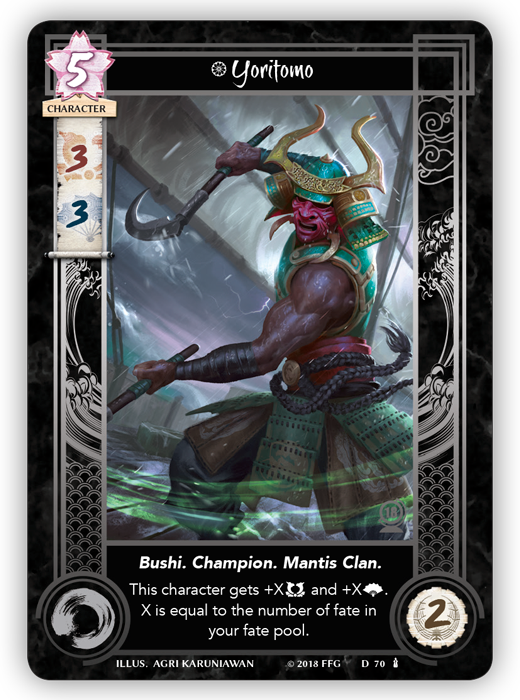 Silver versions of these cards—as well as a silver Winter Court version of Mantis Clan Champion Yoritomo —will be made available on the event's prize wall. 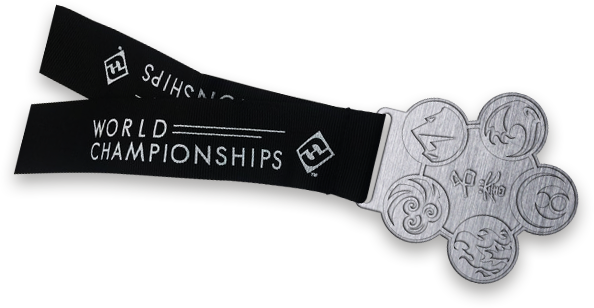 After each Day 1 competition (Day 1A and Day 1B), the Top 32 samurai will earn honor—six custom honor tokens. And because this Winter Court takes place in Scorpion territory, these six honor tokens will be paired with six custom dishonor tokens. Each player who goes undefeated through his or her Day 1 competition (Day 1A and Day 1B) will have accomplished a feat worthy of song—or art. 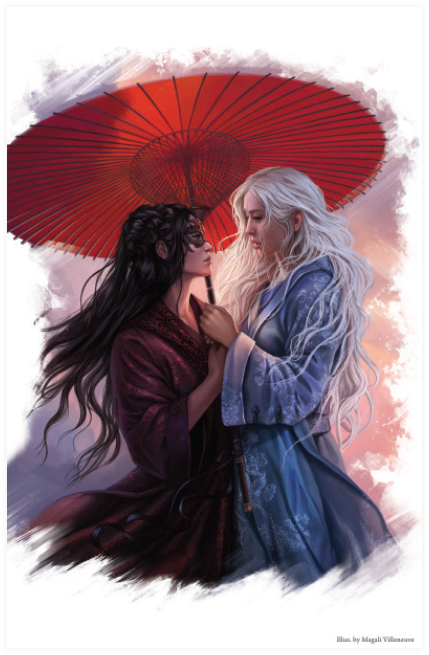 These players will each receive an art print with stunning work by Magali Villeneuve. No matter where they finish overall, the samurai who bring their clans the greatest honor on each Day 1 (Day 1A and Day 1B) will, in turn, be honored for their performances. Their skillful displays will be acknowledged by skillful displays of artwork—art prints by artist Amelie Hutt that beautifully evoke each clan's essence. All samurai who manage a record of 4–2 or better during Day 1 will qualify for the elimination rounds of Day 2. They will also receive a golden Winter Court version of City of the Open Hand. The Top 32 overall will each receive a custom playmat commemorating their performances and their placement into the Top 32, Top 16, Top 8, Top 4, and finals. The Top 16 samurai at the Winter Court will receive medallions—rumored to have been designed by the Emperor himself—that they can proudly wear to proclaim their skills. 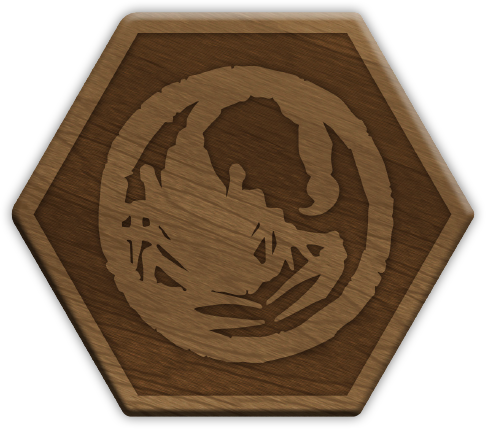 As part of their generous hospitality, the Scorpions have arranged to reward each of the Top 8 samurai with a wooden token box… But will it be empty? Or will it conceal a venomous beast? Perhaps the answer may, itself, depend upon your clan allegiance. 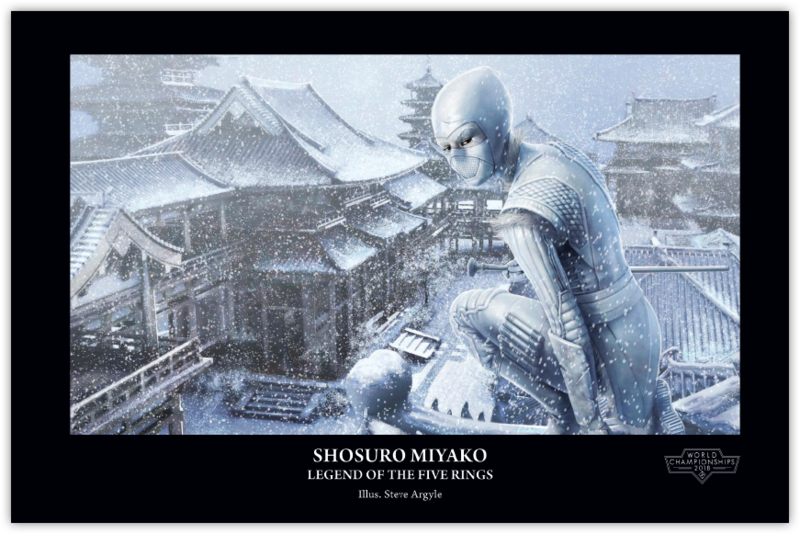 The Top 4 samurai will receive an art print of Shosuro Miyako—depicted on rooftop amid the falling snow by artist Steve Argyle. The seven samurai who best represent the seven Great Clans will each earn the right to make two impactful decisions. 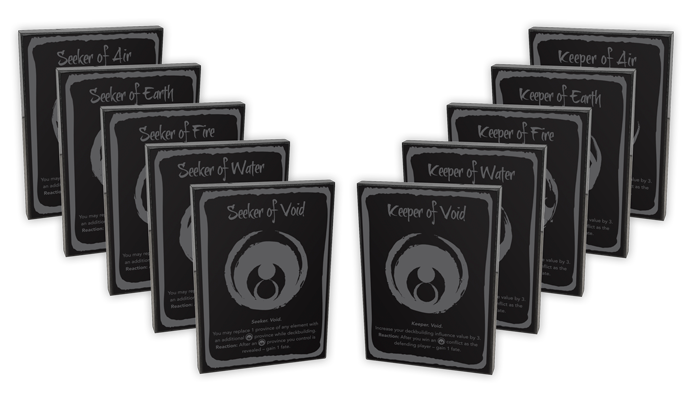 First, each of these samurai will select his or her clan's new elemental role, and the choice will be commemorated by a stone version of the chosen elemental role card. Additionally, we will post a series of letters throughout the weeks leading up to the 2018 Winter Court World Championship. These letters will be published starting in October and will be written by the clan's Champion. They will address all those dutiful samurai who intend to represent the clan at the Winter Court and outline the clan's most pressing concerns. In addition to selecting their clans' elemental roles, each of the seven clans' top representatives at the Winter Court will counsel their Champions. Each honored samurai will help choose which of their clan's families should take the lead in the matters addressed within these letters. 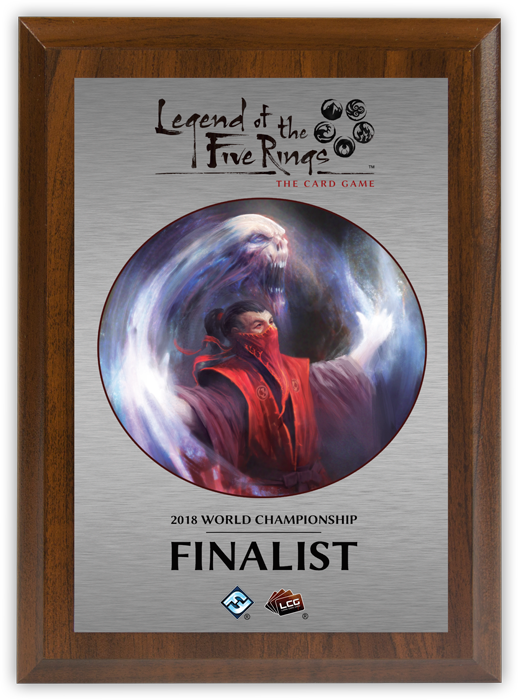 In addition to all the other prizes the Winter Court World Championship Runner-Up receives, he or she will receive a magical Finalist plaque designed to both commemorate a tournament well-fought… and to inspire greater performances in the future! In the end, there will be one honored above all others—the 2018 Winter Court World Champion—the Shogun. 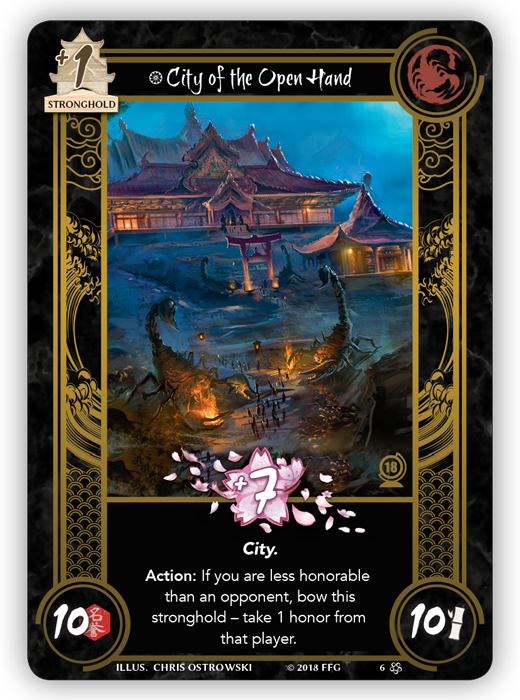 The Shogun will claim The Greatest Prize in Gaming, entering the legacy of the game itself by working with the game's developers to inspire the design of a future card. 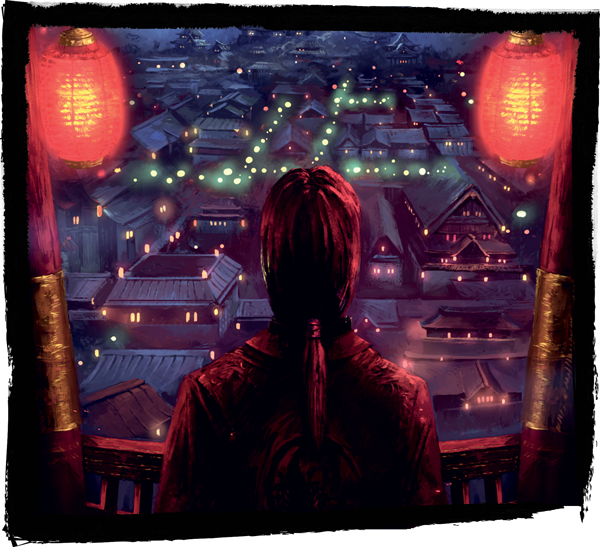 Simultaneously, the Shogun will earn the Emperor's ear and will be able to advise not only his or her Clan Champion about which family should represent the clan in its most important matters, but will be able to specifically recommend one of the family's most talented bushi, courtiers, or shugenja to take on the task. Serve Your Emperor. Honor Your Clan. 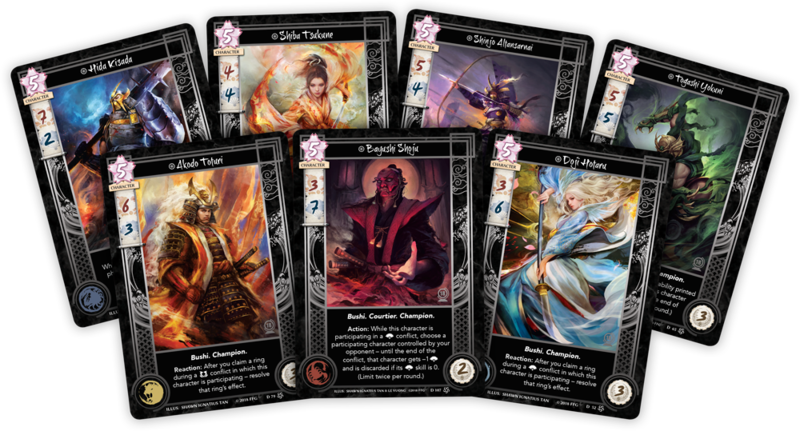 With tensions and conflicts escalating between the Great Clans, much relies upon the samurai who represent their clans at the 2018 Winter Court World Championships. Make sure your clan is well-represented. Win honor for your clan in the Emperor's presence. The stakes are high. The samurai are skillful. Come to join them, and you may earn fame and glory not only for your clan, but for yourself. A very limited number of seats are still available for this thrilling conclusion to the year's Legend of the Five Rings: The Card Game Organized Play—purchase your ticket for Day 1A or Day 1B and make your plans to attend!